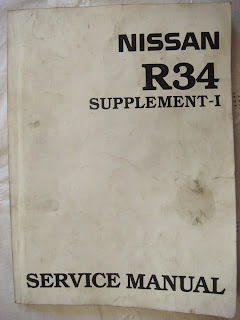 R34 GTR service manual in English. Check out this thread on Freshalloy if you want to get a copy. Everything for free on the internet is only for the GTS and RB25DET. This supplement covers the GT-R, RB26DETT powered car. "I also got a full copy of the Japanese Language BNR34 service manual, the English/Japanese Wiring Diagram book, and the Japanese R34 Owner's Manual." You have to buy it, but at least you don't have to pay $700 for it. or is it diferent from what you got. i understand you have more than just than one book.